My colleague was facing ADF BC development question and asked me to help. He sent me whole application, so I was able to open it directly with my local JDeveloper 11g. While investigating actual question, I noticed strange behavior in ADF BC. For example, attribute types were not recognized and I was getting log messages - oracle.jbo.domain.Number not found. 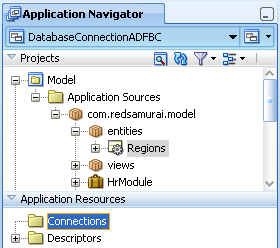 This means, missing database connection definition was causing direct impact on ADF BC development. If you will face same issue, make sure following files are present inside your application - .adf/META-INF/connections.xml, src/META-INF/cwallet.sso and src/META-INF/jps-config.xml. 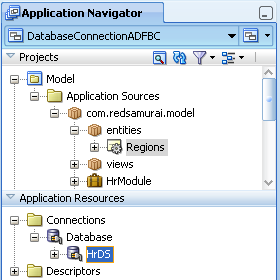 Download sample application with database connection files in place - DatabaseConnectionADFBC.zip. Are you able to reproduce the problem again by deleting the database connection in an application that was previously working correctly at design time? Yes, if database connection is deleted, same problem is reproduced. I am facing the same problem though i have database connection in place. Infact this problem persists only on my instance of JDeveloper (11.1.1.2.0). 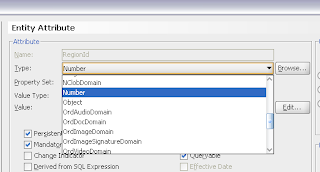 When i create a new new Entity Objects the default datatypes are BigDecimal & java.sql.Date. Other people working on the same ADF application doesn't face this issue. I tried deleting system directory but that didn't help either. Thanks for following up, it seems couple of issues are related to this problem.